At leisure to explore this beautiful island of the Cyclades. Discover picturesque and bustling Naoussa, explore then neighboring Antiparos, enjoy the sandy beaches, and wander in picturesque Parikia. 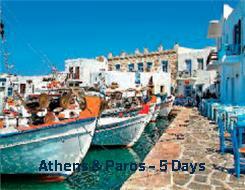 Accommodation on BB, 2 nights in Athens and 2 nights in Paros. Ferry tickets Piraeus - Paros regular ferry, economy class.